External accounts of life in rural Burma have long been shaped by narrow stereotypes of helpless victims and intransigent oppressors. However, as KHRG has increasingly documented, such portrayals fail to accurately reflect the dynamics of life under military rule and the (albeit disadvantaged) efforts which regular people employ to resist abuse, renegotiate relations of power and assert control over their lives. As international engagement in Burma increases, a far more nuanced understanding of local-level political processes remains crucial to developing a rights-based approach to aid provision. To that end, the present report provides summaries of three recent incidents in which villagers sought to negotiate a change or reduction in military demands. All three accounts deal with orders issued by DKBA forces in Papun and Thaton districts of Karen State during May and June 2009. In a departure from the usual KHRG reporting style, these accounts have been supplemented with illustrations based on villagers' descriptions of events provided to KHRG by an independent illustrator. Since starting work in 1992, KHRG has consistently focused on villagers' personal testimonies of abuse and local perspectives on human rights issues. In the course of documenting villagers' accounts, however, it became evident that experience of abuse was only part of the picture. While incident-based human rights reports can effectively highlight the occurrence of abuse, they typically miss the varied, and often successful, efforts which those facing abuse have employed to reduce or wholly evade maltreatment. Such partial accounts also risk misrepresenting as static what are in fact dynamic military-civilian relations. And it is through these everyday, local-level political processes that regular people across Burma have sought to assert control over their lives despite an absence of institutionalised democracy. Any on-the-ground international engagement in Burma will thus inevitably enter into, and become a part of, these everyday political processes. 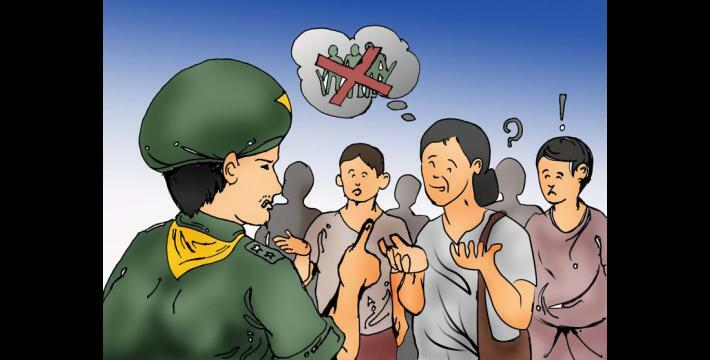 A rights-based approach to engagement in contemporary Burma must therefore acknowledge these political processes and allow local communities to decide upon and shape for themselves any programme of intervention. 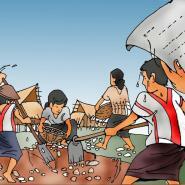 In support of villagers' ongoing efforts to resist abuse KHRG began its Village Agency project in 2005. As one component of this project, KHRG researchers as facilitators conduct workshops in which participant villagers are encouraged to discuss the ways they already resist abuse and how these strategies can be further strengthened and refined. Participants are introduced to stories of village-level resistance from other parts of Karen State as a means of stimulating discussion and innovation. 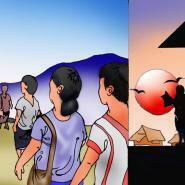 As the second component of the Village Agency project, KHRG has over recent years been more consciously documenting village-level resistance to abuse so as to bring villagers' agency and persistent engagement with local-level political processes to the awareness of the international community. Continuing in this vein, the following text includes three recent accounts in which villagers sought to negotiate a change or reduction in local military demands; which in the cases provided here were all issued by the Democratic Karen Buddhist Army (DKBA). 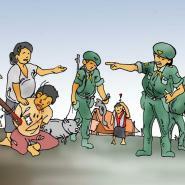 The incidents all took place in Thaton and Papun districts of Karen State in May and June 2009. The information summarised here was collected by KHRG field researchers during interviews with individuals present on the occasions described. These accounts have been supplemented with illustrations based on villagers' descriptions of events. Given the sensitive nature of such stories of resistance, much of what appears below has been censored. On May 15th 2009, soldiers from DKBA Battalion #---, under commander B---, began operations in and around M--- village tract in southern Papun District. At the time, the DKBA soldiers active at M--- village tract began demanding food from the local villagers. The soldiers also issued movement restrictions, according to which no one was allowed to leave the confines of their resident village. In practice, however, DKBA soldiers could not continuously monitor every village in the village tract and would thus only arrive intermittently to check the compliance of local villagers. Residents would therefore freely leave their village when they knew that no DKBA soldiers were likely to be in the area. On May 28th 2009, DKBA soldiers from Battalion #--- arrested two residents of M--- village while they were returning home during the day after having been out visiting neighbouring Me--- village. 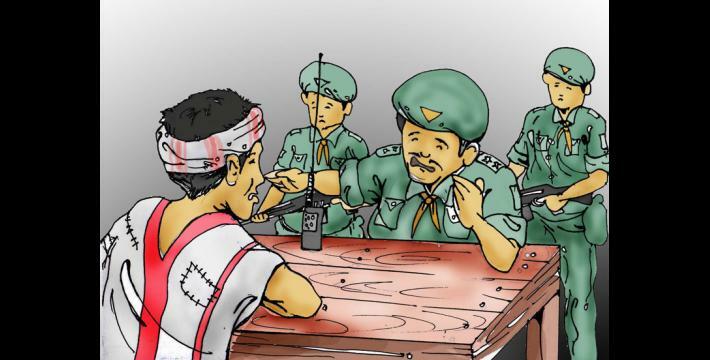 The DKBA soldiers accused the villagers of having violated the DKBA-imposed movement restrictions in order to contact soldiers from the opposition Karen National Liberation Army (KNLA). Upon making this allegation the DKBA soldiers proceeded to punch, kick and, with the butts of their rifles, hit the two villagers. Due to this beating, the two villagers were seriously injured, yet the soldiers proceeded to tie the villagers' hands behind their backs and then took them away to the DKBA army camp. 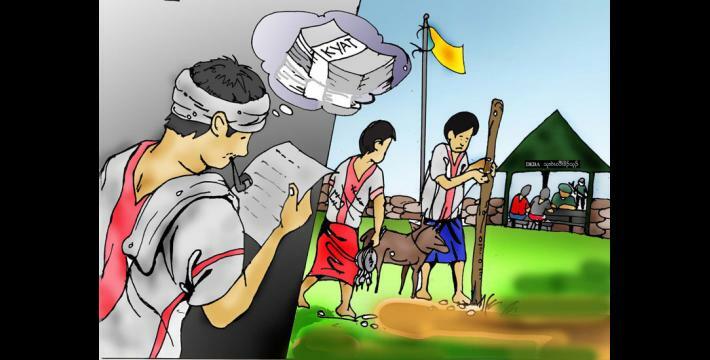 Following the villagers' detention on May 28th, DKBA commander B--- sent a letter to the head of M--- village, in which he demanded that the village head pay 2,000,000 kyat (approx. US $1,818) for the release of the two detainees. The village head knew that he could not possibly collect the amount specified. He therefore reflected on ways of avoiding full payment, yet still gaining the release of the villagers. "I've tried to follow the order as much as I can, but now my villagers have many problems with their livelihoods. And as it's now the rainy season, the villagers don't have work to earn a [cash] income. So, we don't have money to give you. However, we've brought you a goat and one viss [about 1.64 kg. / 3.6 lb.] of chicken." The commander looked at the goat and the chicken meat. He then spoke in a calm voice to the village head and the accompanying villagers, saying "We'll release the two villagers. And anyway, we can't do anything if you can't provide us with the money. But, we can eat the goat and chicken that you've brought for us." 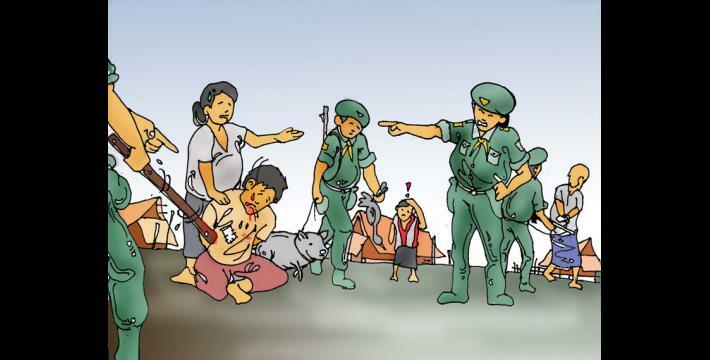 The commander then took the goat and chicken meat (valued together at about 30,000 kyat (US $27.28)) and the detained villagers were released the subsequent day (May 29th 2009). In May 2009, Saw Ba---, commander of DKBA Battalion #---, entered Me--- village, southern Papun District accompanied by his soldiers. Saw Ba--- had decided to build a new army camp within the grounds Me--- village proper. When the local community learned of the location chosen for the planned army camp, the village head went to meet with Saw Ba---. The village head then requested that Saw Ba--- and his soldiers not build their army camp within the village itself. The village head explained that his fellow villagers were afraid that KNLA soldiers would attack the DKBA camp and the villagers would be injured or killed in the fighting. 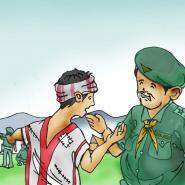 The commander replied, telling the villagers not to raise the issue as his unit would construct the camp as planned. The villagers continued to appeal to the commander about the issue, but the commander would not listen. The next morning, the village head called a meeting with his fellow villagers to discuss ways of solving the problem. The villagers agreed to a dig bomb shelter so that, should fighting occur, they could withdraw there for safety. Following this meeting the villagers began digging the shelter. Then on May 14th, Saw Y---, the commander of the camp at which the DKBA Battalion #--- soldiers were stationed, learned that the villagers were digging a bomb shelter. Wanting to know the intentions behind the villagers' actions, Saw Y--- wrote a letter to the village head asking him why the villagers were digging bomb shelters. The village head replied with a letter explaining the situation. He then went in person to the DKBA army camp located near to Me--- village in order to meet with to the camp commander. 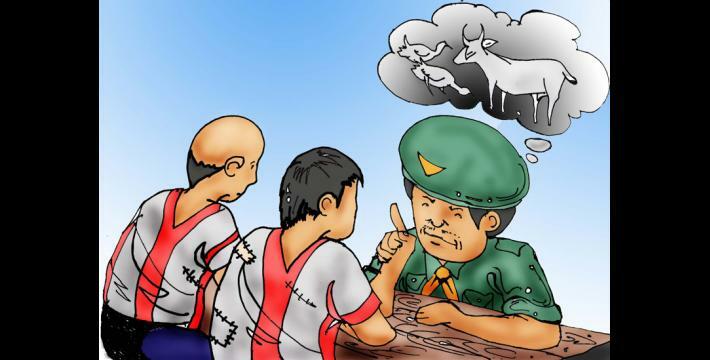 The village head explained that battalion commander Saw Ba--- and his soldiers were planning to build an army camp in his village, so the villagers were worried that they might be injured or killed in the event of a KNLA attack on the DKBA camp. The village head then stated that the villagers did not want the DKBA to build their army camp within the village. 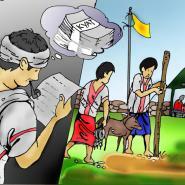 As the village head explained, "If the DKBA wants to build an army camp, they should find a site far from our village." After the village head had explained his position, the camp commander came to agree with the argument put forth. Commander Saw Y--- then told the village head that he would discuss the issue with the battalion commander and tell him not to build the army camp inside Me--- village. Subsequently, on June 29th, DKBA camp commander Saw Y--- called a meeting at his army camp with the village head of Me--- and Saw Ba---, commander of DKBA Battalion #---. As ordered, the village head went to meet with the two DKBA commanders. In the meeting they discussed Saw Ba---'s plan to build an army camp in grounds of Me--- village. Both DKBA commanders then agreed that they would not build the camp within the village and would instead base the new camp at another location. 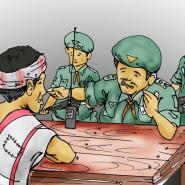 On May 18th 2009, Brigadier Maung Gyi of DKBA Brigade #333 ordered the leaders of 174 villages in Pa'an and Bilin townships of Thaton District to attend a meeting in Ee Tee Sit, at which the camp of Brigade #333 is located. When the meeting took place later that day, there were 180 village leaders present. In the meeting, DKBA commanders Maung Gyi, Maung Kyaw Kyaw, Lay Htoo, Moh Nyoh, Shwe Tha Lah and Myit Weh spoke to the village heads. The aim of the meeting was to inform the village heads that the DKBA would be recruiting new soldiers from the area in order to increase its size. "Right now, if the DKBA has more soldiers, the SPDC will give the DKBA the right to control Karen State... the KNU [Karen National Union] revolution has lasted for more than 60 years but the revolution has provided nothing of benefit for the villagers. It's because the KNU just demands food from the villagers to eat. 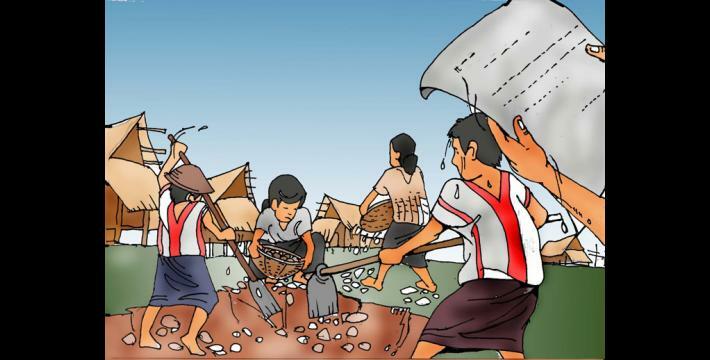 The KNU hasn't implemented any development projects, like the building of roads. So, villagers shouldn't listen to and work with the KNU, because we [the DKBA] will control Karen State. So, villagers [village heads] must give us villagers as new recruits, like we've demanded. Village heads must come and inform us before the end of June 2009 about whether or not they're able to recruit villagers." "We'll fight with the black scarves [KNLA] soldiers because they don't understand anything. Had they have come back and worked with us, we could have already been in control of Karen State by now. So, we need to increase our soldiers in order to fight with them." "You've said that DKBA is doing development work like road construction, but I've only seen villagers who have had to do construction work, not DKBA soldiers. Now you've ordered us to find villagers for new recruitment, but I can't find any villagers to join with the DKBA because Karen will have to fight with other Karen [i.e. DKBA and KNLA will fight together]. 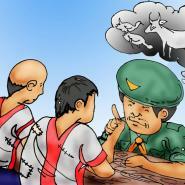 [But] If you fight with the SPDC, even if you demand one villager, we'll give you five villagers instead of one." 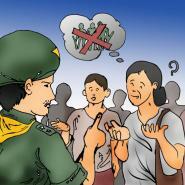 "In 2007, the DKBA recruited soldiers, but we couldn't give you any villagers, so we gave you 1,000,000 kyat [approx. US $909] for each villager [who would not serve as a soldier]. 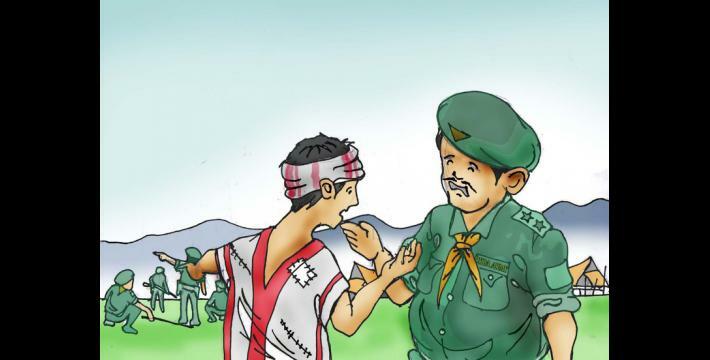 Now, you're again demanding villagers from us for new recruitment. We can't give you anymore. None of the villagers in my village dare join the DKBA." "That's the only way you can get villagers to join your army. But if people who've been caught by you desert with their guns and fight back against you or shoot you dead, don't come and hassle our village. And if you demand money in lieu of new recruits [again], we won't be able to give that to you either. If you want to kill us, you can kill the whole village. We'll die with pleasure. Then the history of the DKBA will remain good [this was said with sarcasm]. I'm telling you this openly in the meeting now and many people attending the meeting here have heard it. You've given us permission to speak out, so I've said what I think." "Go back to your village and try to do as we've said. Some villagers will probably want to join our [DKBA] army. Now the salary of DKBA soldiers is going to be paid by the SPDC government. 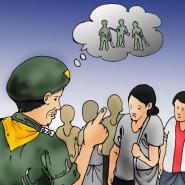 Each [soldier] will get 25,000 kyat [approx. US $22.73 per month]. U Thuzana will arrange the salary with the SPDC for us. All of the village heads should inform us before the end of June 2009 if you can't recruit any villagers. After you inform us, we'll see what we can do and make our decision after that." Following the meeting, the village leaders in attendance returned to their respective villages. Some of the attendees stated amongst each other that they would not provide the recruits to the DKBA. However, KHRG is yet to receive a detailed update regarding more recent developments around this incident. The accounts presented above highlight the persistence with which villagers have sought to resist abuse and determine for themselves their local state of affairs. In some cases such resistance proves ineffective. Indeed, villagers have often been punished for speaking out or resisting demands. However, as KHRG has increasingly documented, villagers have on other occasions successfully employed village-level resistance to evade, or at least reduce, abuse. 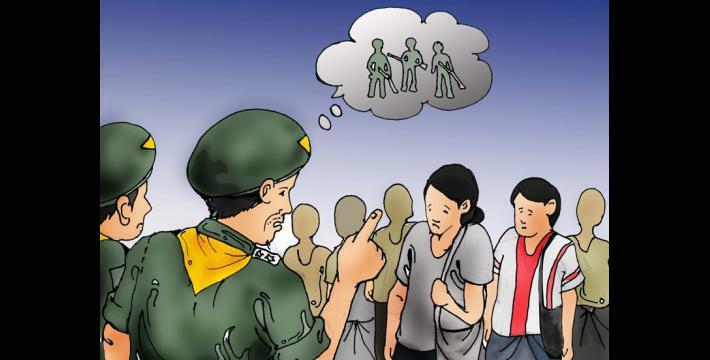 Whether or not village-level resistance to abuse is immediately effective, it nonetheless highlights the agency of villagers, their engagement with politics at the local level and the dynamics of military-civilian relations. As international engagement in Burma increases, a far more nuanced understanding of local-level political processes such as these remains crucial to developing a rights-based approach to aid provision. For an extensive collection of such accounts, see Village Agency: Rural rights and resistance in a militarized Karen State , KHRG, November 2008. For background of KHRG's Village Agency project, see Supporting IDP resistance strategies , KHRG, April 2008. 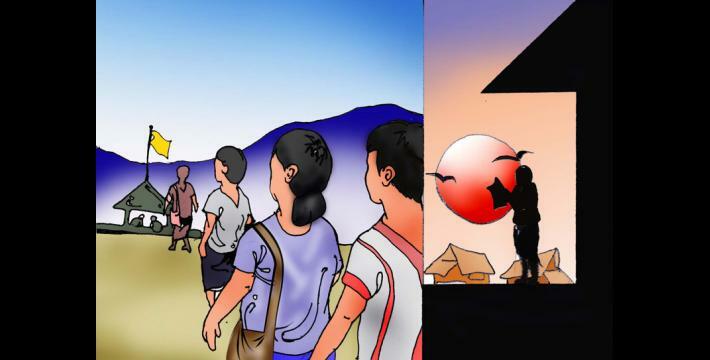 All illustrations included in this report were drawn, coloured and provided for use by KHRG by Saw Taw Nay Htoo, indentified below the images in the report as STNH. Village leaders include village heads, deputy village heads and village secretaries.